Rory and I recently spent a week and a half in the Andes of Peru with our middle son and his wife. 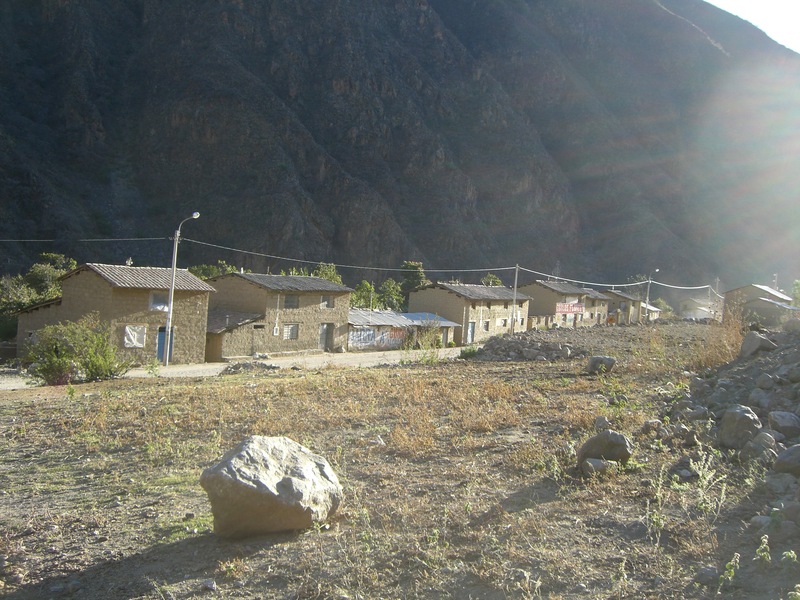 Brendan and Erin live as missionaries in Abancay, a small city in the province of Apurimac. This is one of the poorest regions of Peru, and it’s a stunningly beautiful mix of sweeping mountains, terraced subsistence farms, adobe huts and impossible roads. During our visit to Peru, Rory and I went on one of these mountain trips with them. We rose early in the morning, loaded up the 4-wheel-drive truck, picked up a young dental hygienist from Seattle who is assisting in Apurimac for six months, and bounced over crazy roads to the tiny village of Matará. Along the way we met up with the pastor and a few hermanos and hermanas (brothers and sisters, as the Peruvian Christians call each other) from a congregation in a neighboring village. (Please understand that when I say neighboring village I mean the little pueblo you may be able to get to via a narrow dirt-and-rock road if it hasn’t rained lately; and by pastor I mean the good-hearted man, usually untrained and unpaid, who takes on the care of a congregation in addition to all his other work.) These people had previously begun going weekly to Matará in hopes of planting a church there and were excited about being part of this day of outreach. The day did not begin ideally. When we arrived the schoolroom we had planned to use for the dental clinic was locked and the teacher was gone. So were most of Matará’s residents; we were told they had gone up into the mountains for a drinking party. Well, all right. Brendan and Erin are used to making adjustments. Brendan and some others went door to door, talking to whomever they found and inviting them to the dental clinic and to the film that would be shown in the evening. It was a long, busy day. We used a generator because there was no electricity, used bottled water because there was no tap and no filtration, made trips out to the bushes because there were no toilets. Erin did fillings and pulled out rotten teeth, and the hygienist did dental cleanings. Rory sterilized instruments and developed x-rays. Much of the day I shone a flashlight into mouths so the hygienist could see what she was doing. 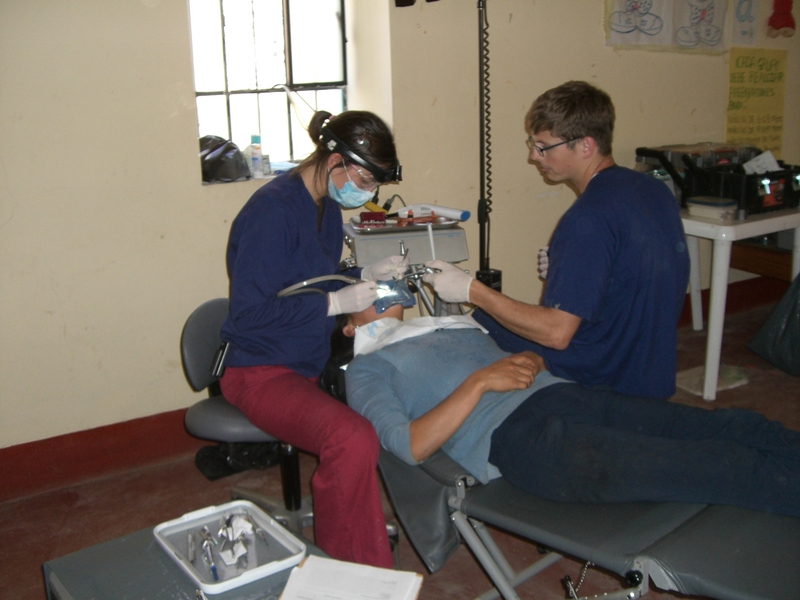 Many of our patients had never been to a dentist before, perhaps never used a toothbrush before. It certainly wasn’t only the old people who were losing teeth. I felt sad for an attractive young mother whose front teeth Erin had to pull out that day. Brendan kept the generator running and assisted Erin at chair side when needed, but he spent as much time as possible talking with the people who were waiting their turn. So did the kind hermanos and hermanas who had come along with us from the pueblo up the road. One hermana in particular impressed Rory and me. We didn’t know her name, but we thought of her as “the smiley lady.” Dressed in the full skirt and wide-brimmed hat that is traditional for Quechua women, she sat with her Bible, talking with people and setting them at ease. Brendan later told us that this particular woman had been the first person in her congregation to recognize this dental clinic and film showing as a chance to reach out to the people of Matará. “This is the opportunity we’ve been praying for,” she had told the others. 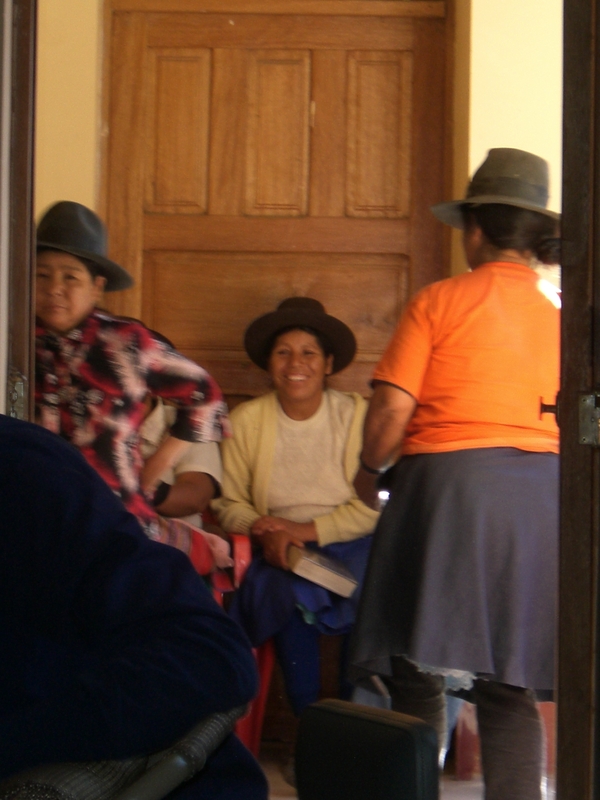 Quechua women outside the clinic we set up. The one smiling in the middle, naturally, is "the smiley lady." At the end of the day when it grew dark (and in those equatorial mountain villages without electricity, it gets very dark, very fast) Brendan used the generator to show the Jesus film, a cinematic version of the Gospel of Luke which had recently been translated into the Apurimac dialect of Quechua. At the end of the movie Brendan gave a short spiritual message to the people in Quechua and encouraged them to come to the prayer meetings the hermanos and hermanas had started. Then, under a sky brilliantly strewn with stars, we loaded up the truck to go home. This entry was posted in Life and tagged kids and grandkids, Peru by Connie Connally. Bookmark the permalink. Thanks, Phil. It was an honor and a gift to be part of this.